You can now play Unison League in most European languages thanks to an update Ateam just dropped on iOS and Android that brings the experience to a far bigger audience. German, French, Spanish, Italian, and Portuguese speakers can now enjoy Unison League in their own language with a reworked UI that ensures a totally smooth gameplaying experience no matter the language. 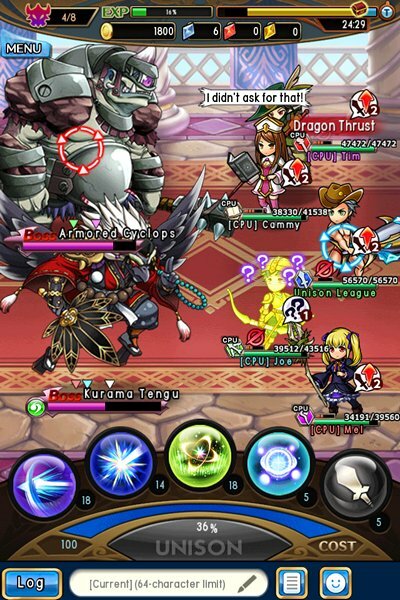 Unison League launched back in 2014 and has been a hit in North American and Japan since, regularly claiming a place in the top 15 grossing games chart in the Japanese iTunes App Store. It’s also collaborated with some huge Japanese IPs like Attack on Titan and Puella Magi Madoka Magica. If you’re yet to experience it, Unison League is a multiplayer spin on the JRPG that challenges you to work with your friends to perform extremely powerful Unison Attacks. These summon a powerful creature to attack in your place. You’ll either fight the AI in PvE or against the playerbase in PvP guild battles. Unison League is very focused on multiplayer and social play in general so you’ll spend a fair bit of time in the player lobby and customizing your character. That customization extends to how you fight as well. At any point you can swap between the five base classes or the advanced ones you unlock as you level up, changing how you play with some nice new skills and abilities. If you like the sound of it, head on over to the App Store, Google Play, or Amazon Appstore right now to get Unison League for free.